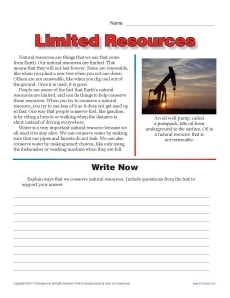 Some natural resources can’t be replaced, as your student will find out in this worksheet. There’s a reading comprehension exercise as well, where he’ll cite information from the text. The worksheet is useful for 6th grade Key Ideas and Details practice for Common Core Standards. Other grades may also use it as necessary.